Soon after IRG acquired the Goodyear Tire and Rubber Company campus, Phase I construction began on the new, 642,000 square foot, Goodyear World Headquarters and was completed in 2013. The new headquarters includes a parking structure, as well the revitalization of certain other buildings on Goodyear Tire and Rubber Company’s campus. The Phase I construction, financed in part by EB-5 funding, created significant job opportunities in the region. Redevelopment nears completion for Phase II, which includes the original 1.4 million square foot Goodyear Headquarters and Goodyear Hall, reimagined as a live, work, play environment known as “The East End.” The East End’s primary use is office space, including large institutional and public government type users and other large office users. The combination of a hotel, office, medical, retail, restaurants and loft apartments creates a dynamic synergy on the property. 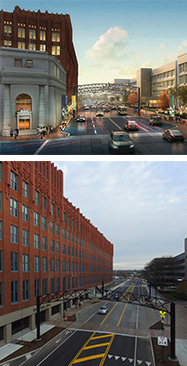 The area running along East Market Street has been transformed into a pedestrian-friendly entertainment district, reflecting extensive streetscape improvements and the renovation of Goodyear Theater, a 1,400 seat entertainment destination, adjoined by Goodyear Hall Gymnasium, a center for national, regional and local events. The site recently hosted an event honoring Lebron James’ philanthropic work, and Hillary Clinton made it a campaign stop during the 2016 election. 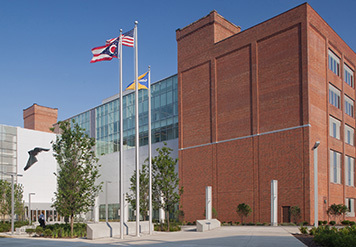 The East End project has won many awards including: Novogradac Journal of Tax Credits Historic Rehabilitation 2016 Historic Rehabilitation Award – Historic Development that Best Exemplifies Major Community Impact; Northeast Ohio Apartment Association, 2016 Property of the Year Award; NAIOP Northern Ohio, 2016 Mixed-Use Renovation of The Year Award; Cleveland Restoration Society/AIA Cleveland, 2016 Distinguished Adaptive Use Award; and State Historic Preservation Office Award, 2016 Preservation Merit. The project has also gained national media attention from The New York Times, The Wall Street Journal and Forbes Magazine.